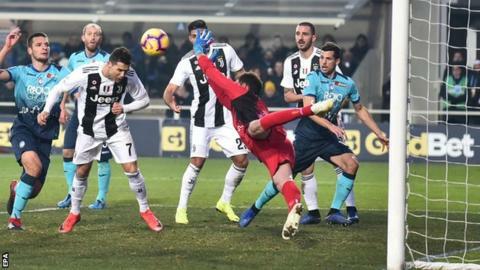 Cristiano Ronaldo scored a late equaliser to rescue a point for 10-man Juventus against Atalanta and maintain the champions' unbeaten Serie A record. Ronaldo, a second-half substitute, scored in the 78th minute, nodding in a corner from close range. Berat Djimsiti's early own goal had put Juventus in the lead, before Atalanta's Duvan Zapata struck twice either side of Rodrigo Bentancur's sending-off. It was the first time Serie A has played matches on 26 December. Ronaldo started the game on the bench for the first time since joining the club for £99.2m in July, but took his tally to 12 goals in Serie A just 13 minutes after coming on. It is just the second time leaders Juventus have dropped points this season. "It's a shame because we still wanted to win, but the team did well," said boss Massimiliano Allegri. Elsewhere, AC Milan failed to score for a fourth Serie A game in a row for the first time since December 1984, as they drew 0-0 with 19th-placed Frosinone. Lazio boss Simone Inzaghi came out on top in a sibling duel as his side beat brother Filippo's relegation-threatened Bologna 2-0, thanks to goals from Luiz Felipe and Senad Lulic. Lazio are fourth in the table, two points above Sampdoria, for whom Fabio Quagliarella and Gaston Ramirez netted in a 2-0 victory over Chievo. Roma climbed to seventh with a 3-1 home win over Sassuolo, while 10th-placed Parma moved level on points with Fiorentina after beating them 1-0. Match ends, Atalanta 2, Juventus 2. Second Half ends, Atalanta 2, Juventus 2. Timothy Castagne (Atalanta) wins a free kick on the right wing. Offside, Juventus. Alex Sandro tries a through ball, but Leonardo Bonucci is caught offside. Attempt missed. Alex Sandro (Juventus) header from the centre of the box is close, but misses to the right. Assisted by Paulo Dybala following a set piece situation. Attempt saved. Gianluca Mancini (Atalanta) header from the centre of the box is saved in the centre of the goal. Assisted by Musa Barrow with a cross. Corner, Atalanta. Conceded by Mario Mandzukic. Substitution, Atalanta. Musa Barrow replaces Andrea Masiello. Attempt missed. Matteo Pessina (Atalanta) left footed shot from outside the box is too high. Assisted by Robin Gosens. Foul by Matteo Pessina (Atalanta). Attempt saved. Alejandro Gómez (Atalanta) right footed shot from the left side of the box is saved in the centre of the goal. Assisted by Timothy Castagne. Attempt blocked. Alejandro Gómez (Atalanta) right footed shot from outside the box is blocked. Assisted by Matteo Pessina. Duván Zapata (Atalanta) wins a free kick on the right wing. Goal! Atalanta 2, Juventus 2. Cristiano Ronaldo (Juventus) header from very close range to the bottom right corner. Assisted by Mario Mandzukic with a headed pass following a corner. Corner, Juventus. Conceded by Berat Djimsiti. Attempt missed. Robin Gosens (Atalanta) right footed shot from the centre of the box is close, but misses to the left. Assisted by Timothy Castagne. Attempt blocked. Timothy Castagne (Atalanta) header from the centre of the box is blocked. Assisted by Alejandro Gómez with a cross. Substitution, Atalanta. Matteo Pessina replaces Josip Ilicic. Offside, Juventus. Miralem Pjanic tries a through ball, but Emre Can is caught offside. Substitution, Atalanta. Robin Gosens replaces Mario Pasalic. Attempt missed. Paulo Dybala (Juventus) left footed shot from outside the box misses to the left. Assisted by Mattia De Sciglio.